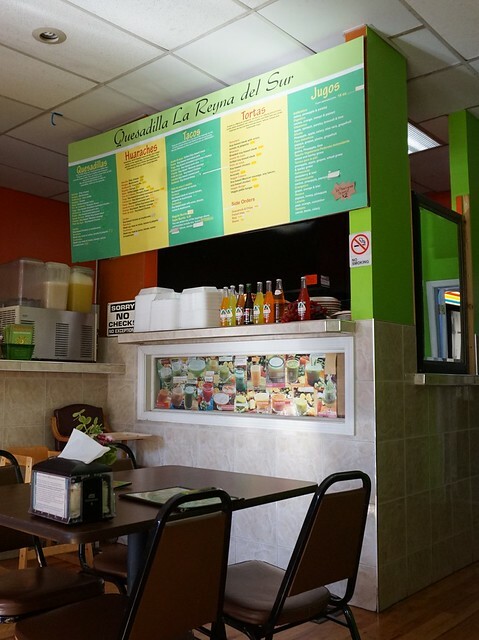 Quesadilla for Amazing Vegan Mexican Food in Chicago – vegan in your city. After spending the day walking around wicker park, JC and I had worked up an appetite. 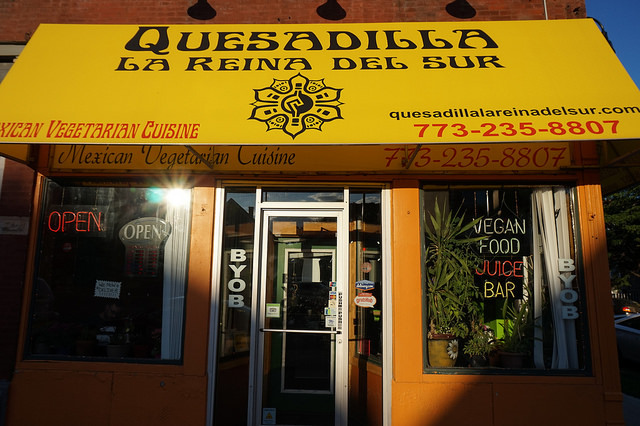 And after repeated recommendations, we had only one place on our mind – Quesadilla La Reyna del Sur, a vegan-friendly (lacto-ovo-vegetarian) Mexican restaurant in the Bucktown area of Chicago. We loved this place, and can finally understand the enthusiasm our Toronto vegan pals had when recommending this spot (thanks Amanda & KT). Everything on the menu is veganizable and everything we ordered was absolutely great. Service was lovely, and when we got the check we experienced this weird shock at why it wasn’t more expensive. 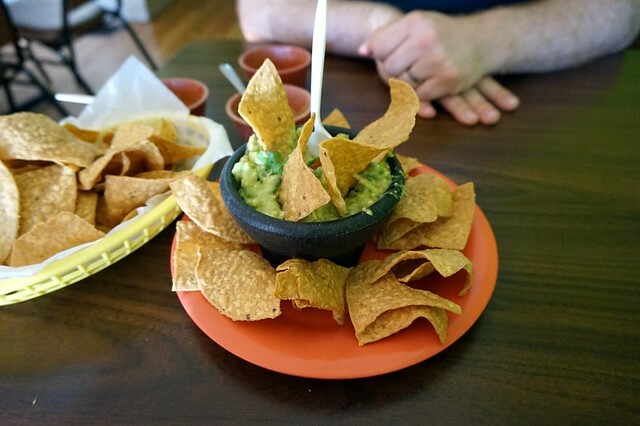 We started with an order of chips and guacamole. Guacamole was fantastic, with cilantro and lime and a good quantity of salt. It was also much bigger than we had expected. This was the beginning of a trend at Quesadilla for us… portions were incredible value for the money. JC and I both ordered Platillo’s (plates) of Tacos, though for some reason I ordered the dinner with rice and beans. I expected much smaller portions, but three tacos/person were more than enough for us. JC had a plate of three tacos, and I don’t remember what he ordered but they looked (and tasted) great. Along with my rice and beans, I had three different tacos. I had asked the server which ones she liked the most because there were lots of “meats” I wasn’t familiar with. She recommended the Asada, Pastor, & Chorizo, so I went with it. And I’m so glad I did, though the impression I got from sampling JC’s taco’s too, is that all of them are tasty, and each variety of veggie-meat is completely unique so it’s worth trying a few different kinds. For dessert they had a vegan tres leches cake that I had to try when I heard the name out of curiosity, but I didn’t really like it.I don’t know what a Tres Leches Cake is supposed to taste like, but I found this one really dense, with a thick oily “cream” on top. But we loved everything else. If you like Mexican food (or even if you don’t) you should give Quesadilla a try if you’re in Chicago. So worth it, and they have really great hours too, check it out. Chicago, Quesadilla, Quesadilla La Reyna del Sur, vegan food. Bookmark. I’m really glad to see your review! I have always been curious about this place, but then the reviews I’ve read have been mixed. It’s kept me from trying it for myself. 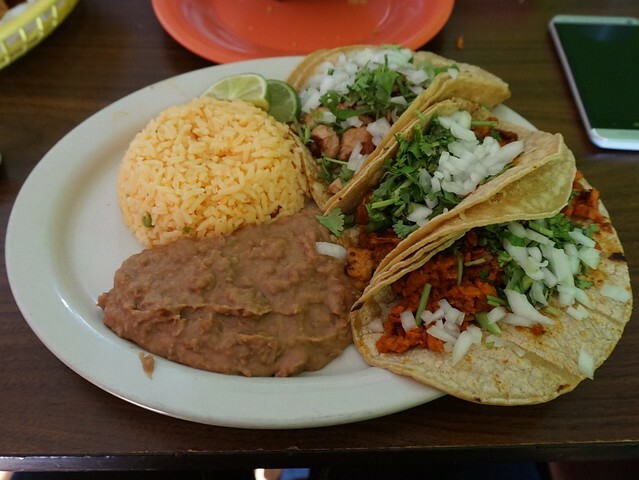 I love Mexican food, and it’s hard to find really tasty, interesting vegan Mexican food where I live. I will definitely seek it out the next time we’re in Chicago. Thanks for the post! To be fair I’ve only had tacos and nachos from them and they have a fairy expansive menu and a whole bunch of fresh juices. 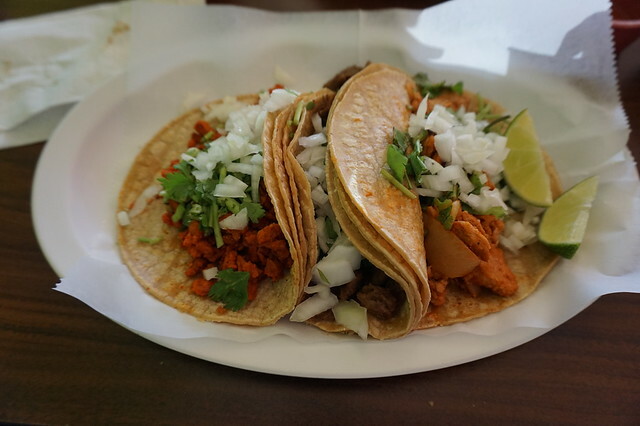 But I really loved the food and if you go, definitely try a taco or two! We actually went back to Quesadilla on the way back through Chicago a couple of days ago. 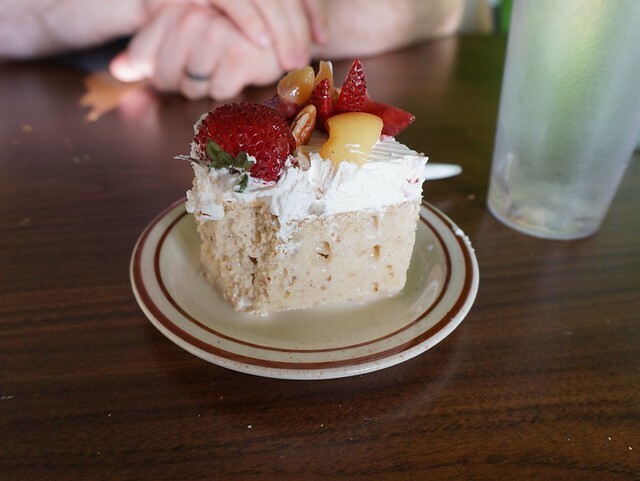 I tried another dessert from them – the rice pudding… and didn’t like it. I’m not sure if dessert is their strong point. We LOVED this place!! I’m glad you did too!